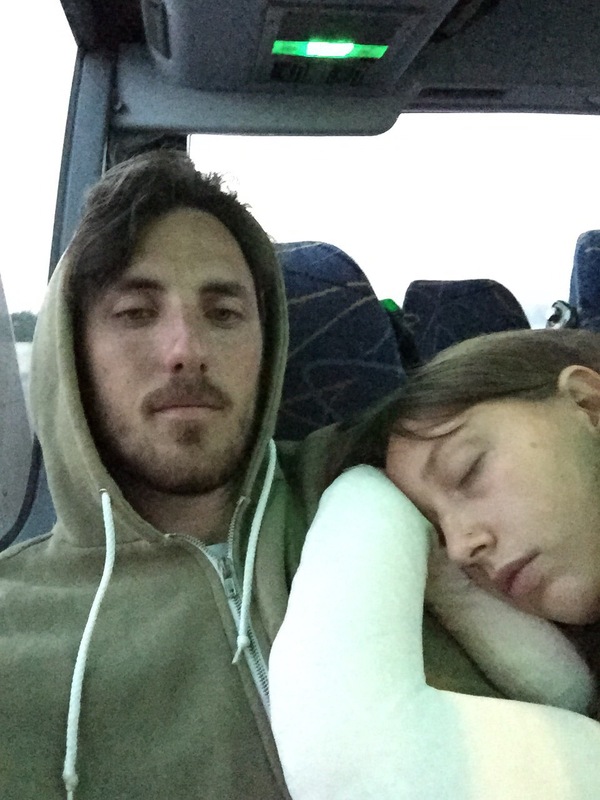 Seven hours and a very ropey sleep later we arrived in New Orleans at the unholy hour of 5am. 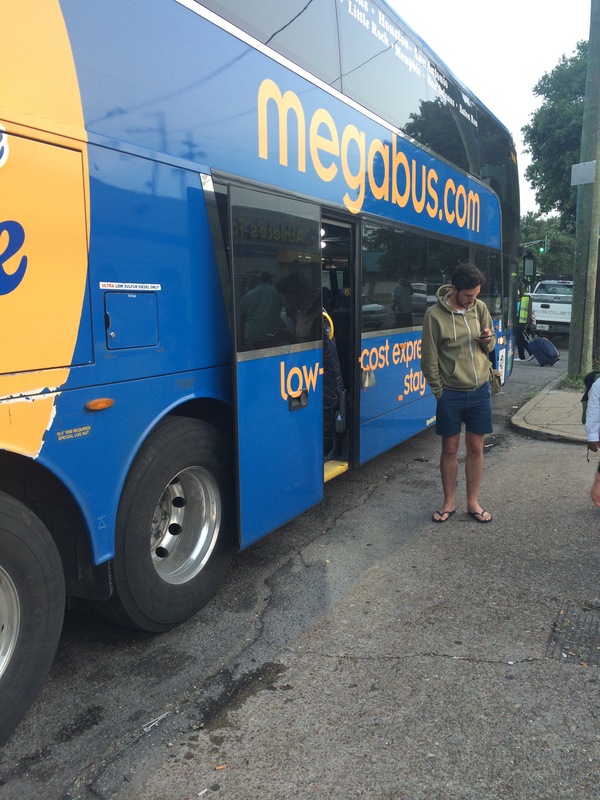 The mega bus doesn’t drop you off in the most desirable area of the city but a hop skip and an Uber drive later we found ourselves right in the centre of the French Quarter. 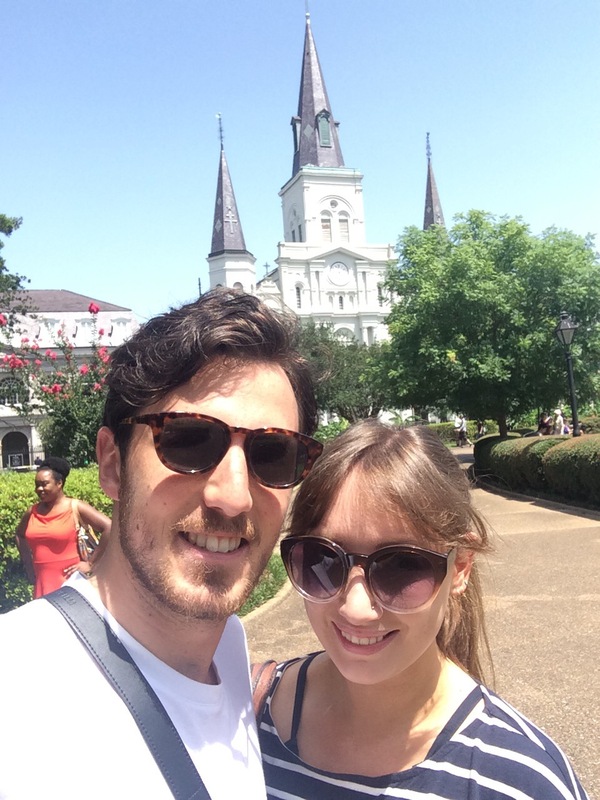 Once again, we hadn’t organised accommodation in the city until we had landed in the Sates, but on recommendation of Alice and Will who had visited New Orleans before the wedding we pre booked a room at the French Quarter Inn shortly before our departure from Houston. We decided to head straight to the hotel even though we weren’t due to check in until 2pm. We must have looked particularly bedraggled however as the manager took pity on us, told us to go grab a coffee and promised that the room would be ready within the hour. Score. 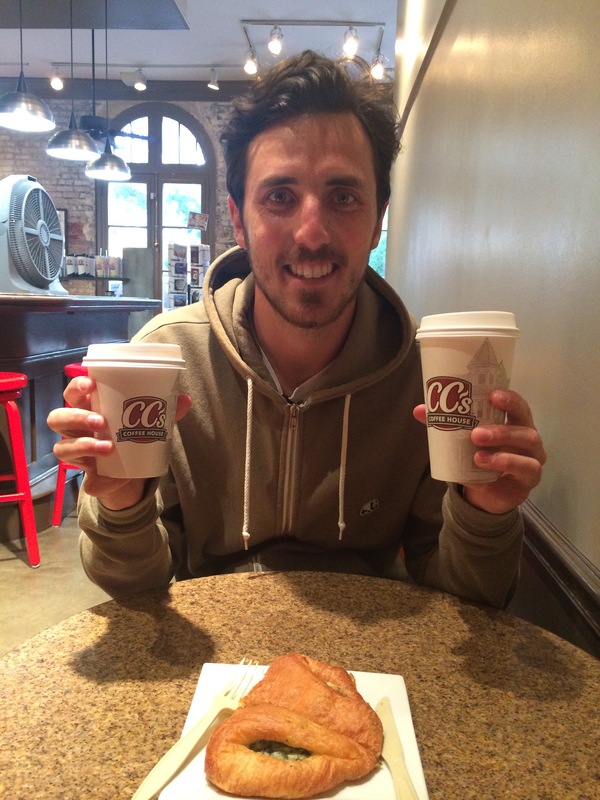 We headed to CC’s coffee on Carlo’s recommendation and ordered savory croissants and the strongest coffees known to man. The coffee shop experience I admit is a bit of a blur, I have a feeling it might have something to do with my quick table-top nap safely concealed in the corner of the café. Right on target we arrived back at the hotel (in the meantime the quiet streets had become buzzing and the temperature had knocked up a few iotas) and were swiftly shown to our gorgeous room – just look at the size of the bed! Possibly the best sight after spending the night on a bus! I must admit the comfort of the bed was too much to resist so we had a very quick disco nap before getting ourselves ready and heading off for the day ahead. A couple of hours later we woke up feeling much more alive and decided to wander around the main areas, The city was now a buzz and with Jazz playing from every corner it was easy to see why the city holds the nickname of ‘the Big Easy’. We headed across to Bourbon Street (another pinch myself ‘I’m here’ moment. After a little wander we decided it was time to eat and so, once again on Carlo’s recommendation, we headed to Mothers for lunch. 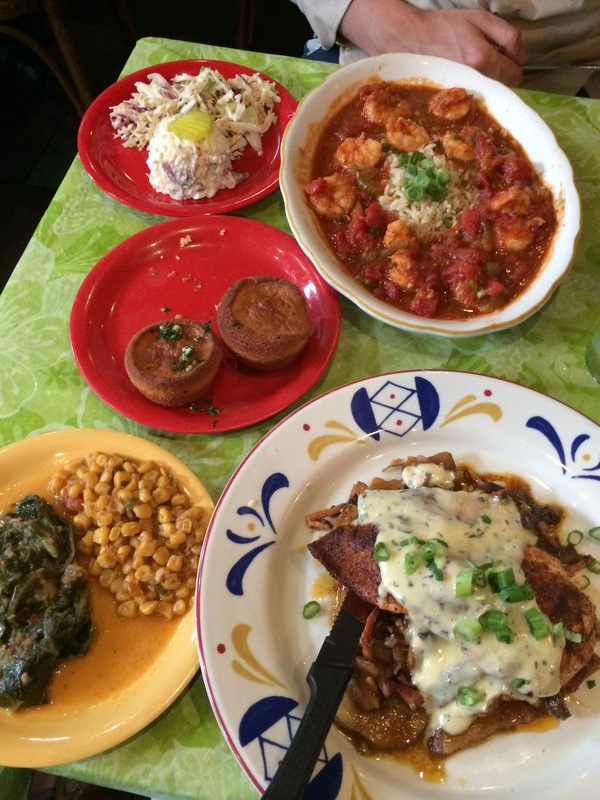 Mothers is a bit of a New Orleans institution and has been serving traditional Southern food since the 1930s. 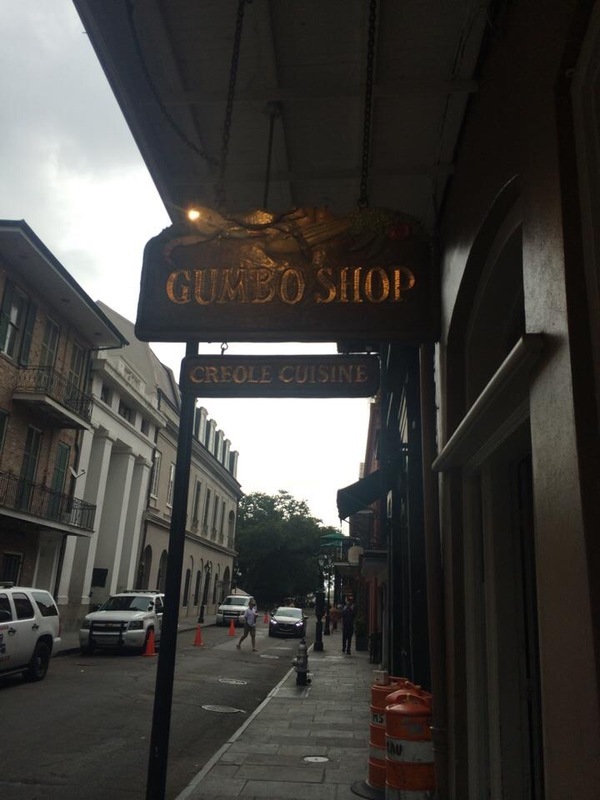 We had to queue for a little but the line went quickly and before we knew it we were headed to a table with our Po’Boys in hands. 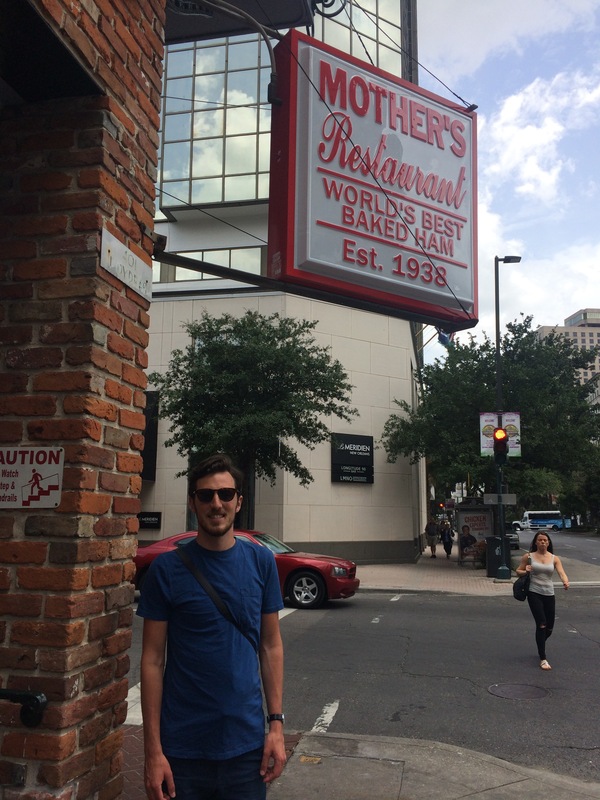 We were told that you can’t come to New Orleans and not eat a Po’Boy – if I’m honest I didn’t see what the fuss could be about, surely it’s just a sandwich. Oh I could not be more wrong – I completely agree, you cannot come to New Orleans and not have a Po’Boy. Miles and I both opted for the Famous Ferdi Special – New Orleans sub bread with ham, roast beef, the original debris (the bits of beef that fall into the pan) and au jus gravy. They are literally the most amazing sandwiches you will ever eat. The no frills décor of the restaurants adds to the experience and transports you right back to the 1930s. Full and satisfied from our lunch we decided to take a wander through the city and ended up at the Outlet mall at the River Walk [add in bit from home]. 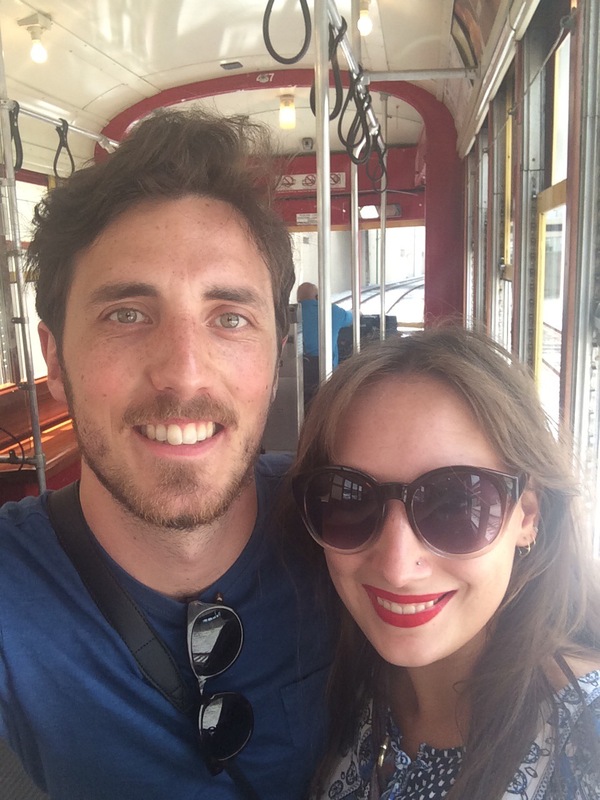 After a little while (and much self-restraint on my part) we hopped aboard the Street Car tram which would take us back across to the French Quarter. 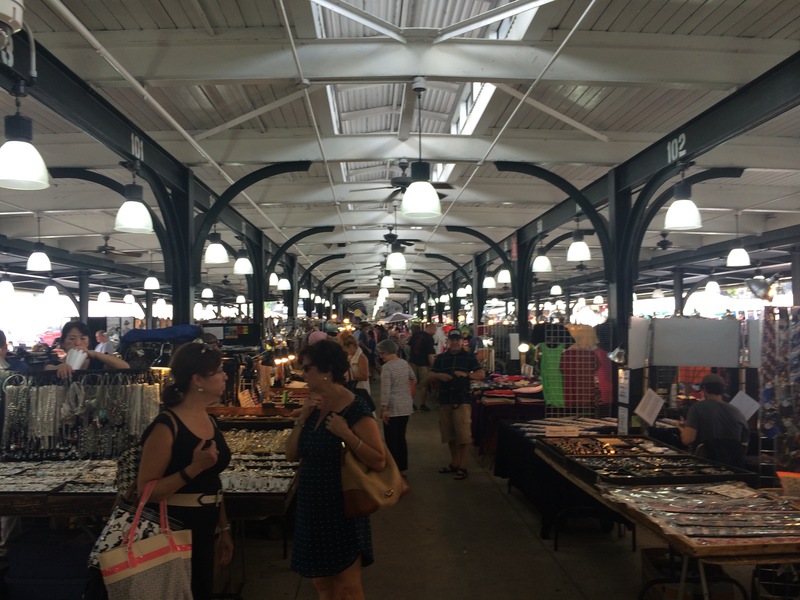 We hopped off the tram right next to the French Market so popped in to have a wander. In all honesty most of the stalls were selling the usual tourist tat but it was interesting to see none the less. At the back of the market there’s a small collection of food stalls however we weren’t interested, we only had one food item in mind – beignets at Café du Monde which, as if by coincidence, was located just past the market. 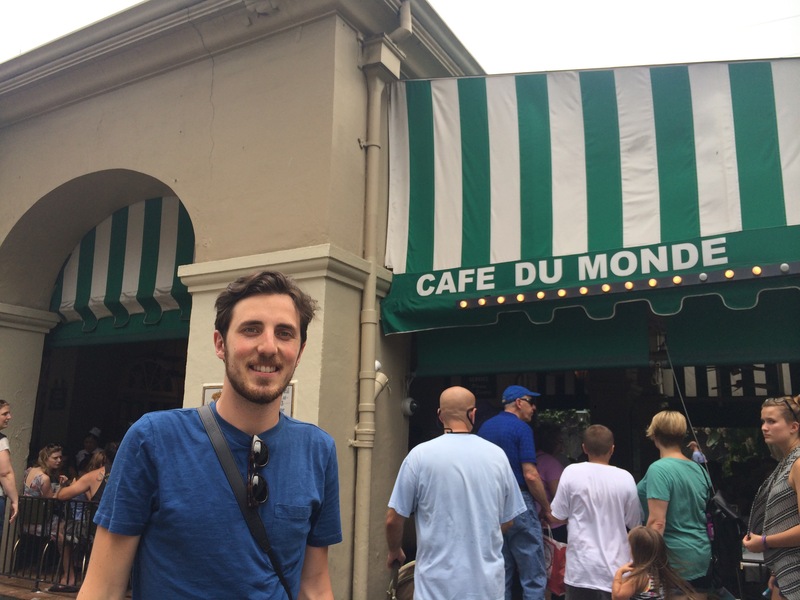 Café du Monde is a complete New Orleans’s landmark, and just like the Po’Boy you cannot come to New Orleans and not try their beignets – fluffy deep fried choux pastry topped with a mountain of icing sugar. We grabbed a table out on the terrace and enjoyed the delicious sweet doughnuts – although beware the icing sugar goes everywhere; it’s certainly not advisable to wear black if you do decide to tuck in! After dusting ourselves down we departed the Café and continued to wander around the town. After a while we headed back towards the hotel and got ready for the evening. 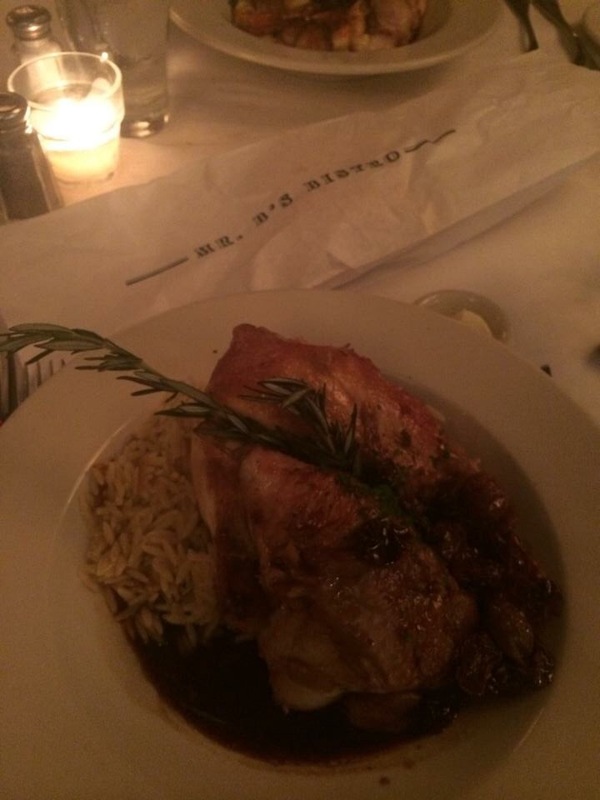 Before we headed to New Orleans, Carlo gave us a big list of places we must visit and restaurant recommendations. One of these restaurants was Jaques-imos which was a short uber ride away on the other side of town. 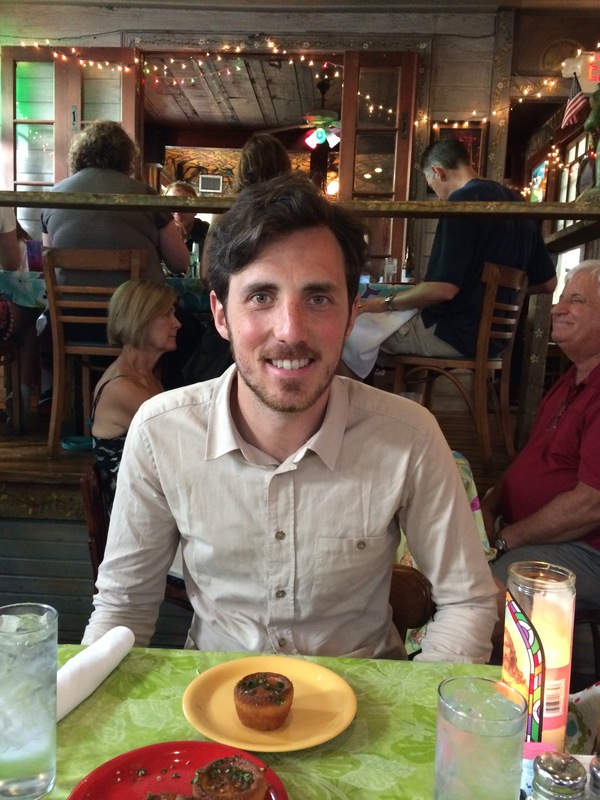 This was probably one of our best meals of the trip – proper southern food which was absolutely delicious. I had fried green tomatoes for starter (I’ve always wanted to try them after loving the film as a child) and a delicious chicken main course with sweetcorn and all the sides! I also had a deep fried mussel which by my face you can see I enjoyed..! Miles had a prawn jambalaya which he said was amazing. 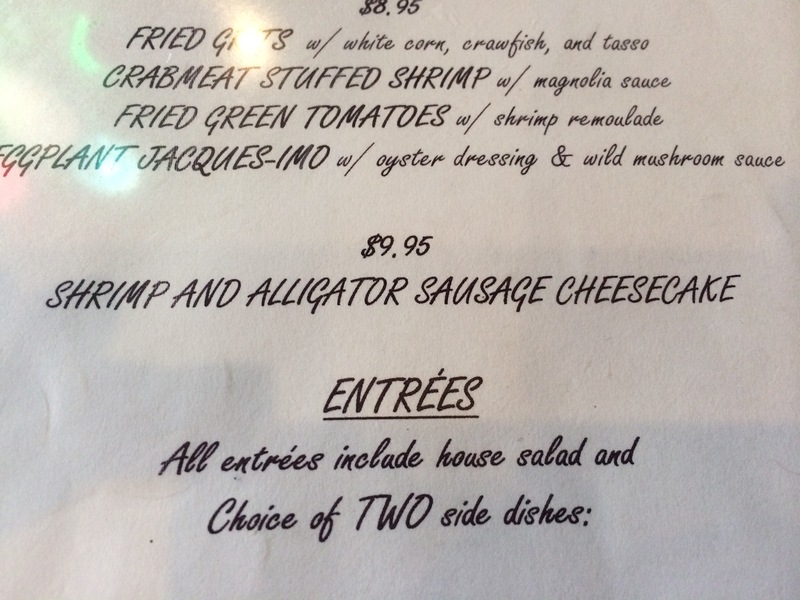 We both forewent the option of the shrimp and alligator sausage cheesecake which apparently is the restaurant’s signature dish! We would completely recommend this restaurant to anyone visiting the city. 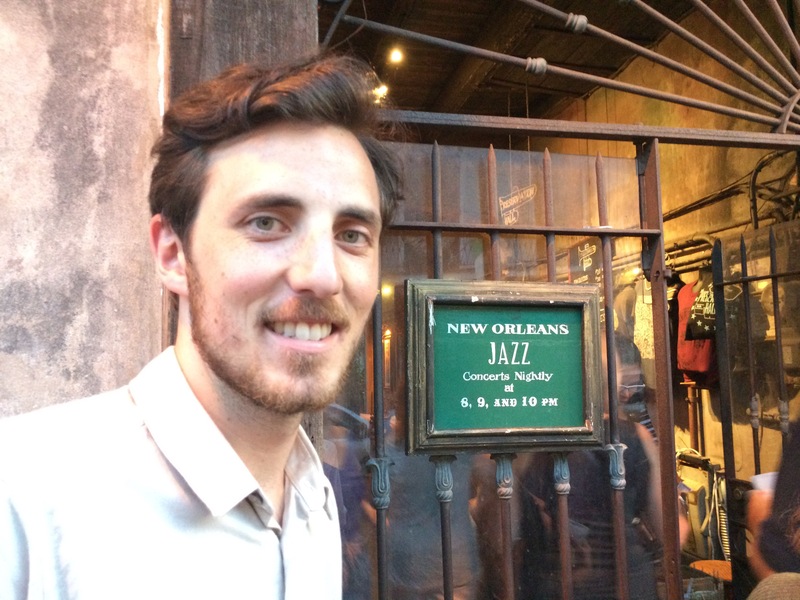 Stuffed, we headed back to the French Quarter with the aim to of seeing a set at the Preservation Hall jazz venue. The Preservation Hall is in the center of the French Quarter and was established in the 1960s to protect, preserve, and perpetuate Traditional New Orleans Jazz. The hall has its own house band and they perform three shows a night – people queue up a couple of hours beforehand as the hall is small and places go fast! We bought a couple of beers and joined the line. Luckily we made the cut and made our way in– it’s a really cool venue which is dimly lit with paint stripped walls. There are a few benches at the front but most people stand. The show was brilliant – it was only an hour or so long which flew by, but the music was great and really got us into the New Orleans vibe. At around 11pm we filed out (after a quick stop off into the voodoo store opposite!) and decided to make our way back to the hotel. The pool was still open so we donned our cosies for a midnight swim before heading to bed exhausted. The next morning we woke up early ready for a full day ahead – we had lots of places that we couldn’t wait to see. 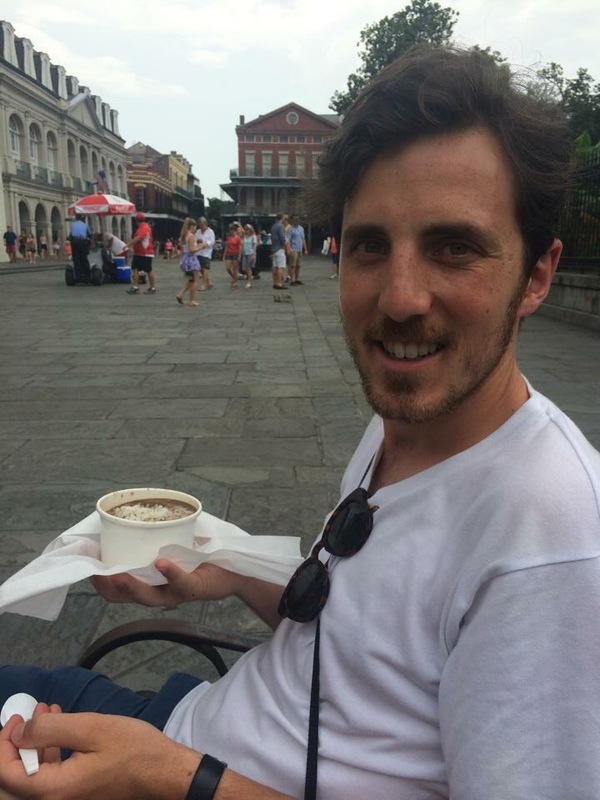 After quick breakfast at CC’s, we headed to Jackson Square where we had a wander around and admired the St Louis Cathedral. We met a couple in the square and all ended up being each other’s photographers! 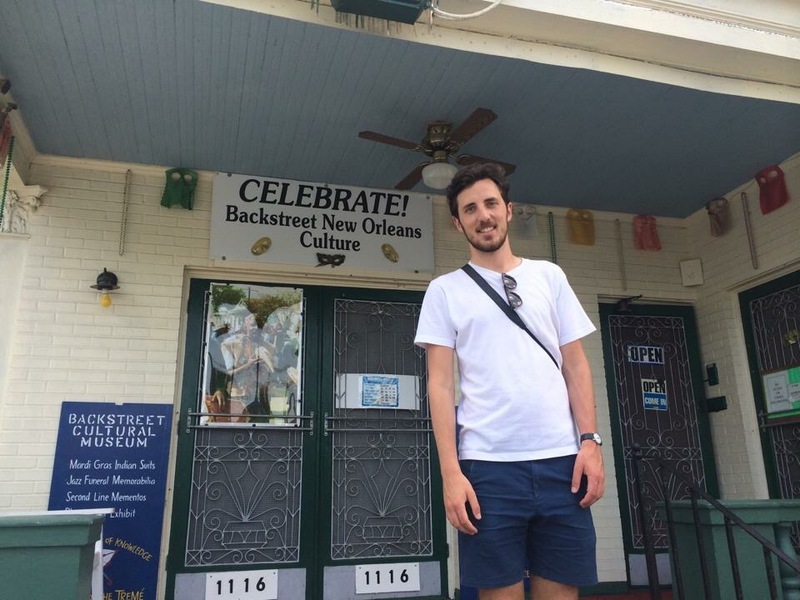 Next we headed over to the notorious Treme neighbourhood. The Faubourg Tremé (the official name of the area) is not only America’s oldest black neighbourhood, but was also the site of significant economic, cultural, political, social, and legal events that have shaped the course of events in Black America for the past two centuries. We’d wanted to visit this area so that we could pop into the Backstreet cultural museum. 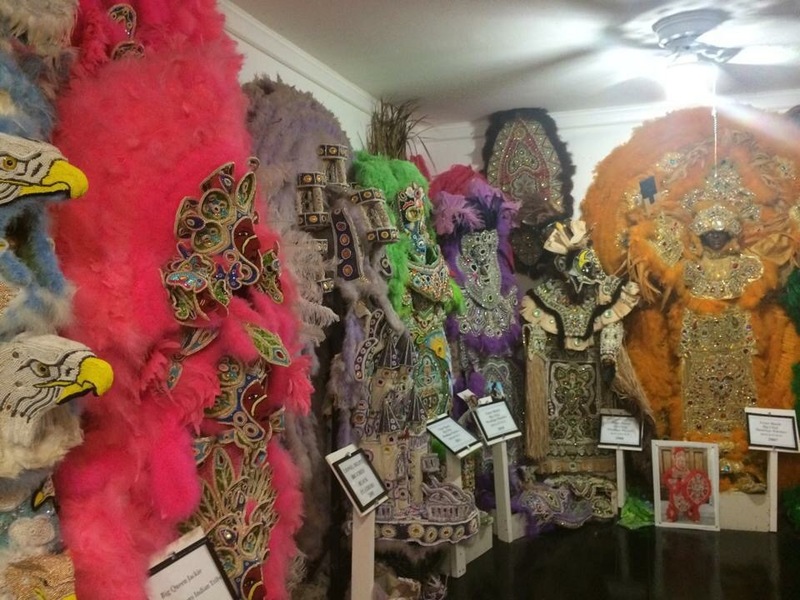 The Backstreet Cultural Museum holds the world’s most comprehensive collection related to New Orleans’ African American community-based masking and processional traditions, including Mardi Gras Indians, jazz funerals, social aid and pleasure clubs, Baby Dolls, and Skull and Bone gangs. It really was fascinating and made all the more interesting the owner, Sylvester, who showed us around. Once we had been suitably filled with the culture of the area we wandered back (in the boiling heat) to the main areas so we could have a wander up Bourbon Street. Even in the daylight it’s bustling and has a real party vibe to it. We popped into Pat O’Brien’s to sample their famous signature drink, the Hurricane, which absolutely blew our socks off! Feeling a little squiffy we decided it was time to grab lunch and, again on Carlo’s recommendation, we bought pots of gumbo from the Gumbo shop and proceeded back to Jackson square to enjoy our lunch and listen to the jazz band in the sun. 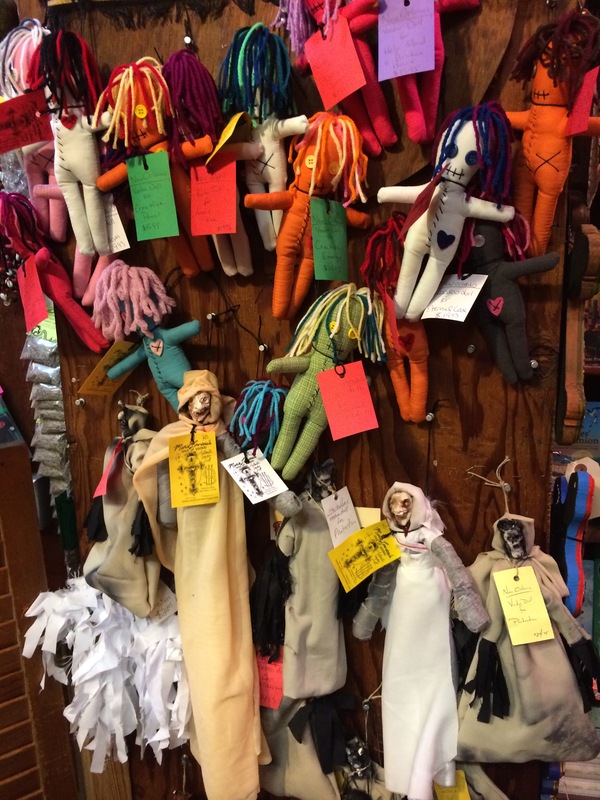 New Orleans is famous for its voodoo/witchcraft vibe. There’s all sorts of shops around the city selling love potions, voodoo dolls, talisman spells and Ouija boards just to name a few. 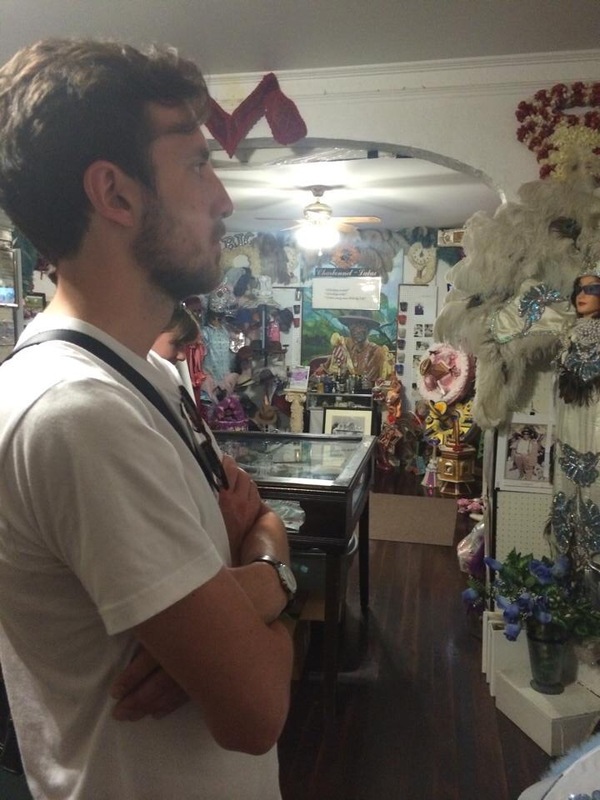 The most famous shop is Marie Laveau’s House of Voodoo (named after the city’s most notorious female witch) it’s definitely well worth a visit. 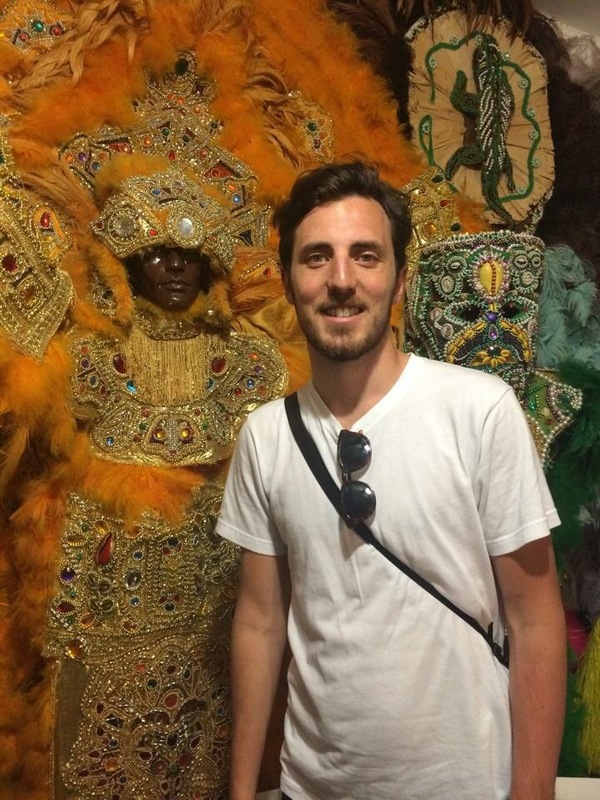 I’ve always found this sort of thing fascinating and was well up for embarking on an organised voodoo tour – Miles was not so enamored..
Just the fact that this is even considered! 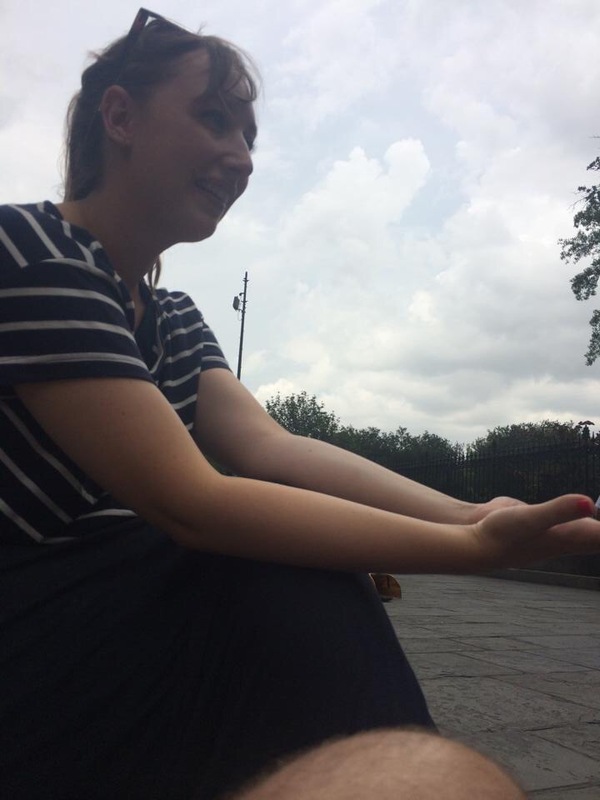 As a compromise Miles let me have my fortune told after we’d finished our lunch in Jackson Square. The fortune teller, ‘true gypsy reader Gina’ told me that Miles was the one, I should stop trying to get rid of him, and that we would settle down and have two children together. 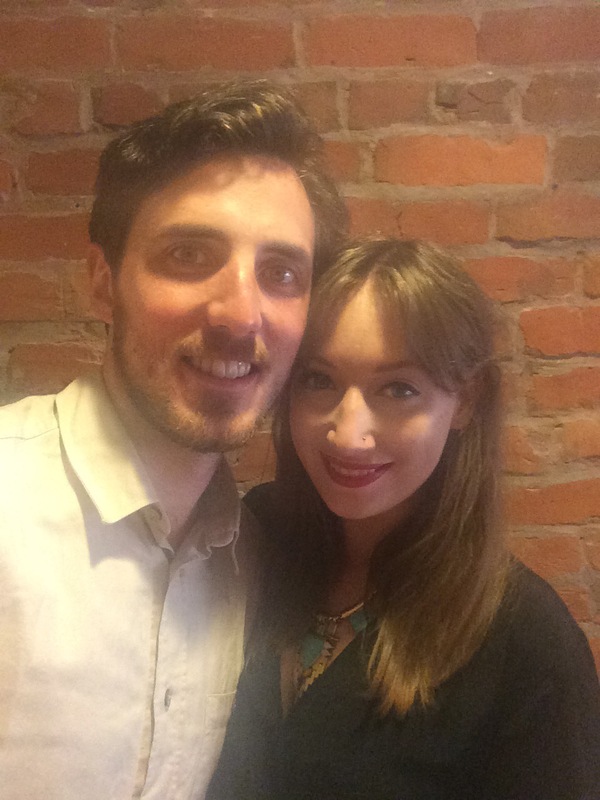 She also said that she could see cancer in the family…’ Now I may be a little sceptical, but it was pretty vague advice and ultimately she may have got the clue that Miles was my boyfriend simply by the fact that he was sat next to me the whole time. Regardless, it was a fun experience and definitely a must do for New Orleans. Full of gumbo and the mysteries of my future life solved we hopped on the tram and headed towards the city’s Garden District. Here you can wander and see the rows of amazing historic mansions dating back to the 1800’s – they are literally beautiful. You can see why people such as Sandra Bullock, Beyonce, Mos Def and Nicholas Cage all live in the neighbourhood. 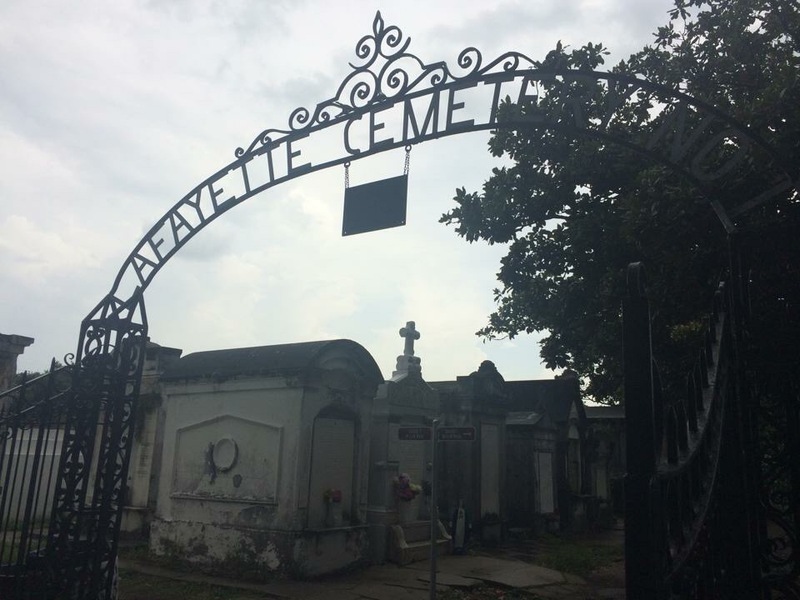 After being full of house envy we took a stroll across to the Lafayette Cemetery. New Orleans buries it’s dead in a completely original way to any other city. Due to the extremely high water table of the city, and the fact that the city was originally built on a swamp, it was realised that burying the dead underground was ineffective as the graves were found to flood and the coffins would float back to surface level. Because of this, the dead are laid to rest in rows upon rows of raised tombs, somewhat like houses in a city. It’s not surprising the graveyards are described as ‘cities of the dead’. 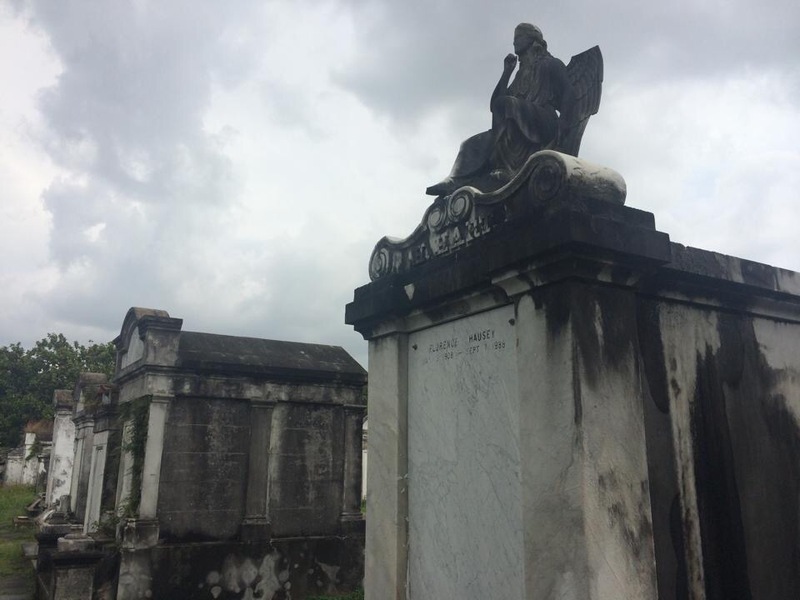 Some of the tombs in the Lafayette cemetery are a century and a half old and range from exquisite family and society tombs to copings and wall vaults – it really is well worth paying a visit. Morbid fascinating at it’s very best. A little later we headed back towards the French Quarter for a wander. We popped down to the river bank to look out over the Mississippi River and look at the famous paddle steamer the Natchez. We headed back to the hotel to get dressed (and have a couple of drinks) before heading out for our big night out – the last night of the trip! We headed to Mr B’s Bistro for a slap up meal which was absolutely delicious. I had a gorgeous chicken dish and Miles opted for the seafood. It was such a lovely meal. Once we’d finished our mains we settled our bill and headed to our second restaurant of the evening where we would be having our dessert. New Orleans’s famous Bananas Foster at the restaurant where it was invented – Brennans. Bananas Foster is a dessert made from bananas and vanilla ice cream with a sauce made from butter, brown sugar cinnamon, dark rum and banana liqueur. The dish was created at Brennans in the 1950s and it would have been wrong to try it anywhere but here. The waiter brings a pan right to your table, cooks and flambés it right in front of you. It’s absolutely delicious. Completely stuffed we wandered up towards Bourbon Street which was now completely full of revelers. I remember before coming to New Orleans I read loads about Bourbon Street being dangerous, gang violence etc. I have to say I didn’t feel unsafe at all but I guess it’s always sensible to be conscious. 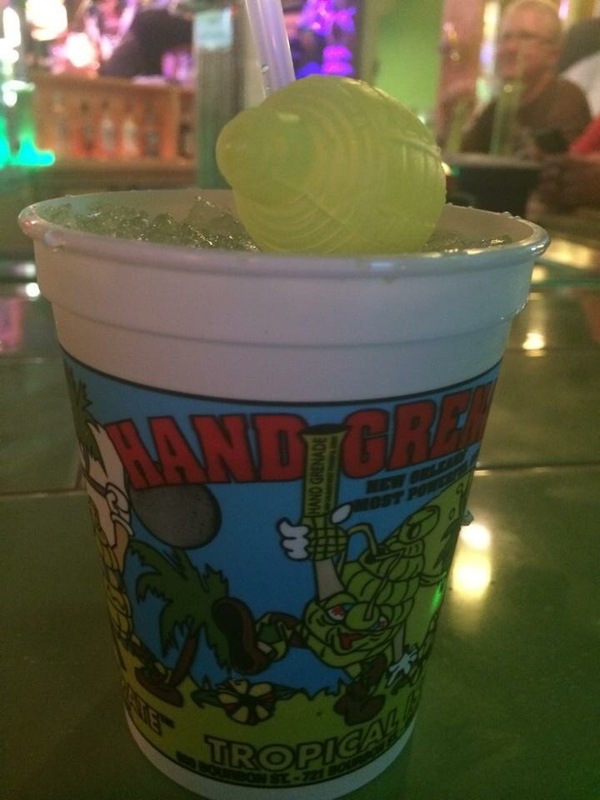 We popped to the Tropical Isles bar to try their famous drink the Hand Grenade with the reputation of being New Orleans’s most powerful drink. In a similar vain to the hurricane this knocked our socks off. The cup has made it’s way back to London with us as a souvenir. 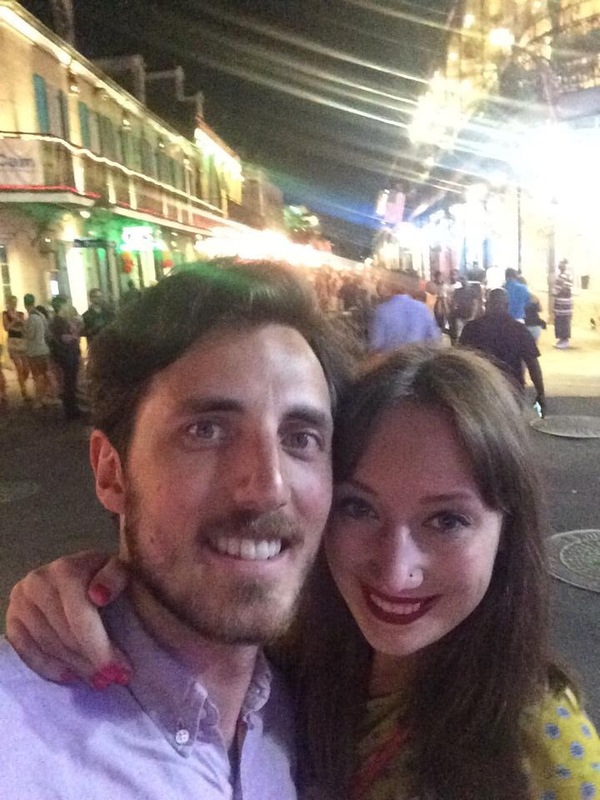 We did a bit of a bar crawl up Bourbon Street making our way through bars and music venues – it was great. After being Bourbon Street’d out, we headed to Frenchman street to get our final fill of jazz. 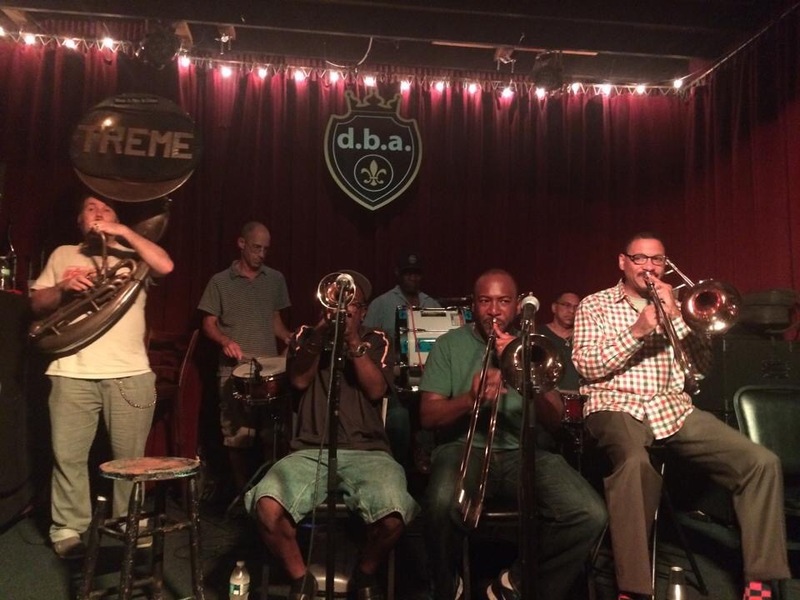 We visited The Spotted Cat Music Club and DBA bar where we watch the fantastic group called Treme. We had such a fun night and it really was the perfect end to the most amazing trip across America.